Near Renssaler, Indiana as I headed south on Interstate 65 towards Indianapolis. There were a lot of them in this area. I see something like this and it strikes my fancy and I think, "This would be a cool place to stop and take photos." Whimsical stopping, when you're heading some place, is not on the itinerary. 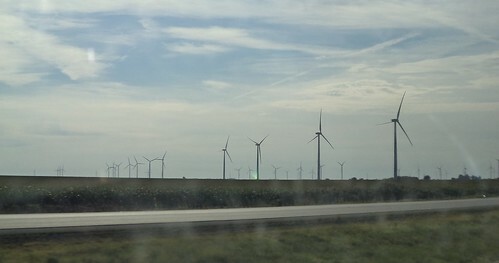 I had to be content with what I could quickly shoot out the windows as I drove past acres and acres of windmills. 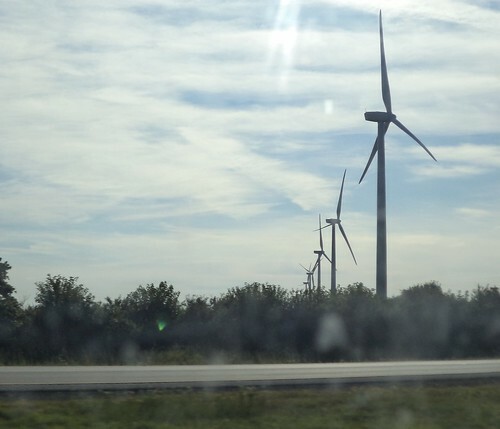 This part of Indiana is flat so it's extremely conducive for wind power generation. I'm sure there's a reason for the way they are placed on a parcel of land. What I thought was neat was, as I drove past the stands, they looked like sentinels in the field. The streaks at the top of the photo are from sunlight reflecting off my plastic side windows. It was chilly so I had the windows zipped up at this point. As I am of a certain age, there is a song that popped into my head as I drove through this area.